The UK will expel 23 Russian diplomats after Moscow refused to explain how a Russian-made nerve agent was used on a former spy in Salisbury, the PM says. Theresa May said the diplomats, who have a week to leave, were identified as "undeclared intelligence officers". She also revoked an invitation to Russia's foreign minister, and said the Royal Family would not attend the Fifa World Cup later this year. It refused to meet Mrs May's midnight deadline to co-operate in the case, prompting Mrs May to announce a series of measures intended to send a "clear message" to Russia. Mrs May told MPs that Russia had provided "no explanation" as to how the nerve agent came to be used in the UK, describing Moscow's response as one of "sarcasm, contempt and defiance". 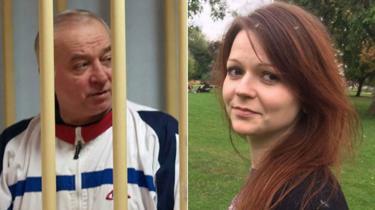 The PM, who was earlier briefed by senior intelligence chiefs in Downing Street, added there was "no alternative conclusion other than that the Russian state was culpable" for the attempted murder of Mr Skripal and his daughter.